Portal and Portal 2 might not be new business, but they’re always a crowd favorite. So when we stumbled upon this Wheatley LED Flashlight, we knew it was something to share. He might be a bit dim, but this flashlight is not. While Wheatley might not have been the brightest personality core in the bunch, this collectible flashlight sure is. This mighty mini is finely detailed, with movable handles. 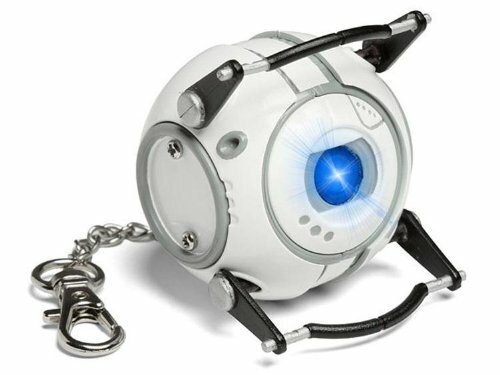 On top of the core is a button and when you press it, Wheatley’s blue eye comes to life and lights your way. Just like the real Wheatley, this flashlight will come in handy as you try escape a darkened testing facility. Of course you will want to make sure he stays firmly in your hand while in use. that Aperture technology is always hard to trust. The flashlight is handheld, includes batteries, and is available on Amazon for around $13.